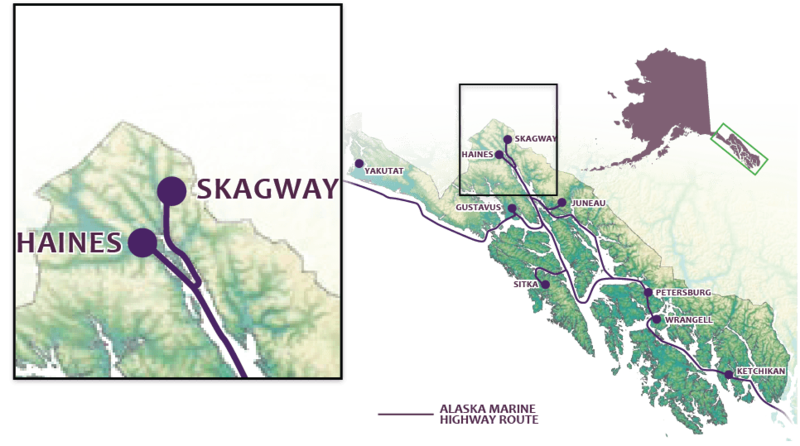 The Tlingit people have inhabited the area around modern Skagway for thousands of years. In the 1880s, after gold was discovered in Juneau and Sitka to the south, pioneers came into the area and established a trading post in nearby Dyea. When gold was discovered in Dawson City, Yukon, the rush was on and thousands of prospectors hurried north, most coming through the quickly built town that was named “Mooresville.” By 1898, Skagway was the biggest town in Alaska, with a population over 10,000. Today, thanks primarily to the National Park Service, downtown Skagway has been restored to its boomtown glory and is part of the Klondike Gold Rush National Historical Park. The park also maintains a site in Dyea, the beginning of the Chilkoot Trail, on which thousands of hopeful prospectors walked to the Yukon goldfields, carrying all belongings on their backs over snow-covered mountains.